North Country Semi-Weathering (Sea) Green is a premium quality roofing slate. A percentage of these slates will weather to tones of brown and buff over time. In 2017, we supplied 115 squares of 16” x random widths x ¼” for the Moffat Library re-roof which was part of the library’s major restoration project. 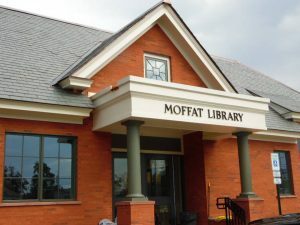 The Moffat Library, built in 1887 was named after David Moffat, a local of Washingtonville who made his fortune in the railroad and mining business. 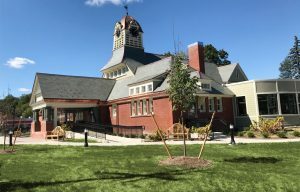 In 1885, he wanted to give back to his community and commissioned the building of the Queen Anne style building which was designed by New York architect George Edward Harney. In 1994, the Moffat Library was added to the National Register of Historic Places. In 2011, the library was forced to close after severe flooding from Hurricane Irene. 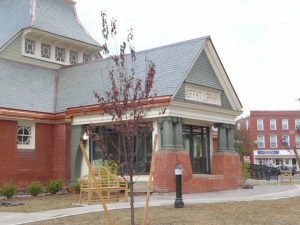 In 2014, the library received a construction grant and work began in 2016. 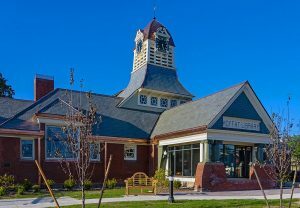 The library’s slate roof was replaced with new slate shingles similar to the original grey color slate installed in 1887. Copper snow guards (snow retention system) were installed above the entrance ways to prevent personal and property damage caused by avalanching snow. These snow avalanches are a result of friction that is lost between the slate roof and the snow which is due to heat loss from the building. 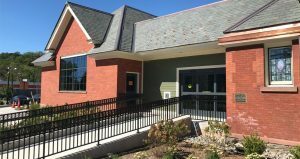 The historic Moffat Library grand reopening and ceremony took place on September 16, 2017. Thanks to the quality of the slate roof tiles and the roofing contractor’s workmanship, this slate roof should last 100 plus years!